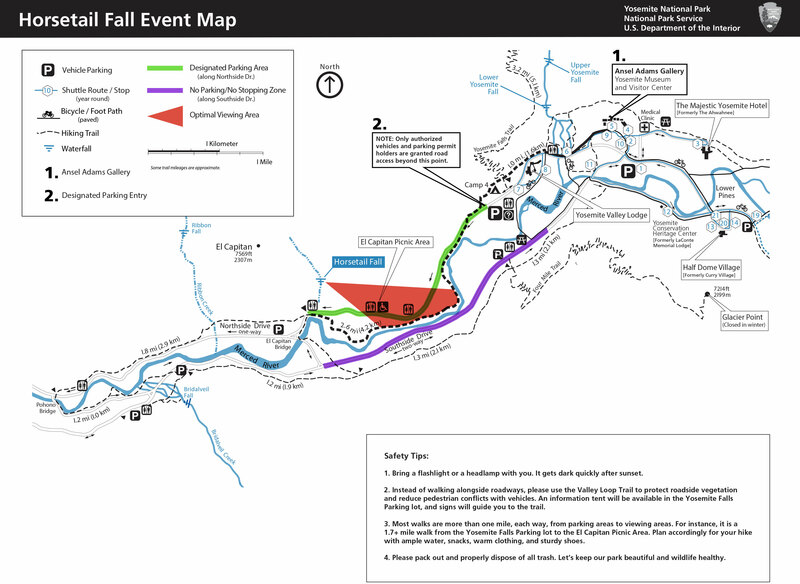 In 2018 Yosemite instituted some new rules, especially pertaining to parking and to getting to the viewing locations. See more information below. Last year I posted the times for the Horsetail Fire Falls event and discovered hundreds of people had found my blog and printed out the times! Thank you all for finding my post and taking advantage! I’ll continue to post them for each year. 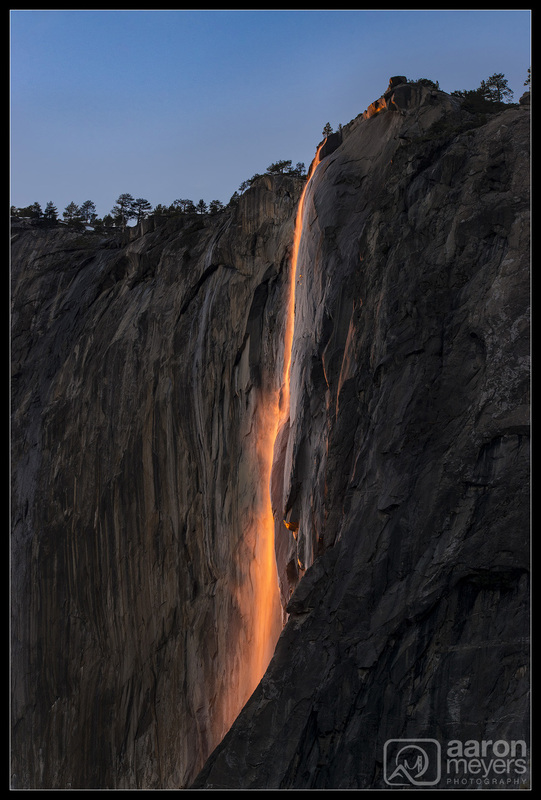 Everyone always asks me when the best time to view the Horsetail Fire Falls will be, and more importantly, when to photograph it. Each year I calculate when this will happen and here’s the breakdown for 2019. 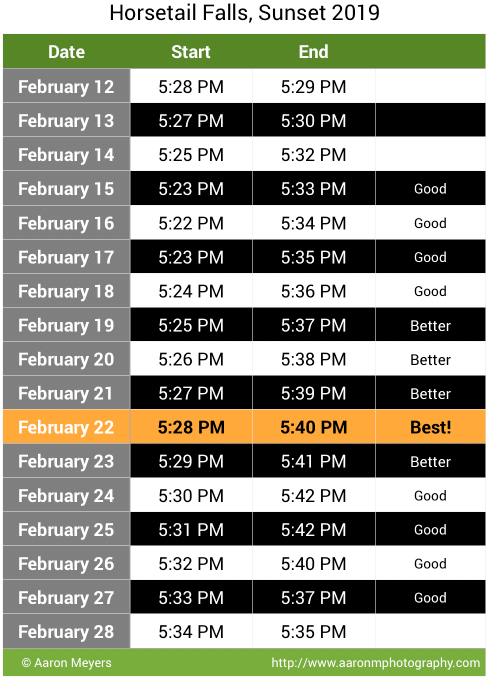 For those of that are savvy and know that this also occurs from the moon, I’ve included the moonlit times as well. There needs to be water in the waterfall. Last year we finally had a good year. Let’s pray the rain/snow continues and we get another good Fire Falls year! 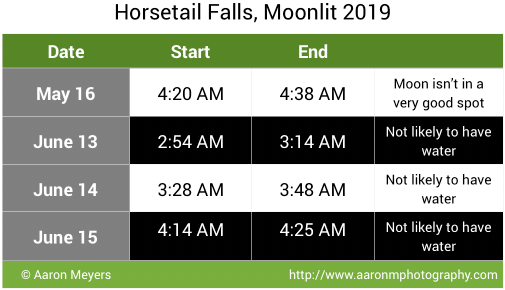 There’s a slight chance that you’ll get to see a moonlit falls this year, if the conditions turn out OK.
May 16th: Probably not likely. Ideally the moon would be at an Azimuth (position in the sky) between 252° and 258°, however, on May 16th it’ll be at 260°. The elevation of the moon is also a little too high in the sky, though it should still cast the orange/red glow. 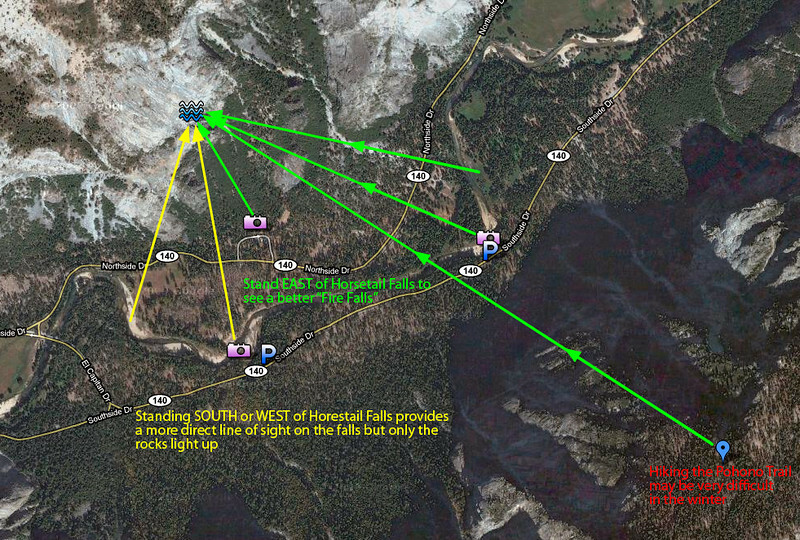 June 13-15th: These have more ideal conditions but I do not expect Horsetail Falls to have any water. El Capitan picnic area (on Northside Drive). This is the most popular (click to see Michael Chang’s photo) and most crowded view of Horsetail Falls. 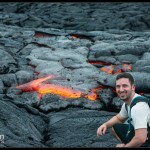 This is where Galen Rowell took his famous ”Natural Firefall” photo. This location provides the closest view, but it’s further east and a harsher angle and is better in late February (perhaps the last week of the Fire Falls as the sunset moves east). You can get some great photos from here but it is recommended to go further east during the early week of the Fire Falls and to hit this spot at a later week. Parking for 2019 is by permit only, so get your reservation ahead-of-time, or be one of the lucky day-of permit winners! Parking Permits: Parking is no longer allowed on the roads near the viewing locations unless you have one of ~200 permits. See the above link for obtaining a permit.